How it works - CONNECT WITH YOUR FOOD AND YOUR FARMERS! Our vegetables are beautiful, colorful and full of life. The variety and quality of vegetables we offer cannot typically be found in a grocery store and we hope this is as exciting for you as it is for us. You will probably be introduced to a new vegetable or two during the season. We will be your guide with recipes and kitchen tips. 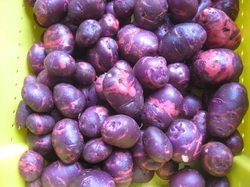 At right: Purple Viking Potatoes. You will eat seasonally, enjoying what is freshest and best suited for our Joanna loam soil. Eating Broad Wing's weekly harvest will connect you with the changing flavors of our Berks County seasons. Your food will be harvested just for you, right before you receive it and, like us, you will happily anticipate the first harvest of a crop in its season. For example, our fall carrots, broccoli and greens fill with a rich sweetness that cannot be found in the trucked-in California harvest where Pennsylvania frosts are unknown. Our CSA gives you choice about what vegetables you take home. Members will find a full market-style set up and will have the option to choose more than one of some items and completely skip others. We are Certified Naturally Grown, following organic standards and keeping the chemicals out of the crops. 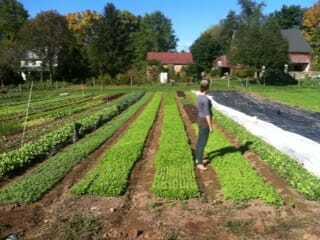 It is simple: Sun, soil, water, good seeds (mostly organic themselves, chosen for their resistance to common local diseases), and careful attention are our main inputs. We work to minimize our tillage, build our organic matter with cover crops and compost, and bring minerals to the soil from sustainable sources. We share our vegetables with local food banks. All farmers and gardeners know certain crops offer times of incredible generosity and harvest bounty. In 2014 we supplied donated shares to Birdsboro Berks Encore and their meals on wheels recipients. We also donated produce to the Chester County Food Bank. ​In 2015, New Jerusalem Lutheran Church Food Bank bought produce from us at a reduced wholesale price for their bimonthly distribution. We donated vegetables to the St. Mary's Episcopal Church in Ardmore after our Saturday Market. In 2016 and 2017 we partnered with Greater Berks Food Bank. ​We offer 18 weeks of vegetables and two share sizes, the Fox Box and the larger Lion's Share. great for a family or even a couple or ​single person who love their veggies! Examples of items include: a pint of strawberries, 2 lb of tomatoes, a bunch of cooking greens, a bunch of carrots, a pint of sugar snap peas, 1 lb beans, 1/2 lb spinach, 1 lb broccoli and one head of lettuce. Payment plans are available when you reserve your share. If those don't work for you, please contact us and we will be happy to work with you. Limited workshares positions are available for the cost or partial cost of the share: please inquire. As the nights lengthen and cold weather sets in, we become very busy making plans and creating new infrastructure for the farm. This is the season where we take what we've learned and transform the future farm. We purchase new supplies and equipment, repair our tools and structures, refine our crop plan and purchase all our seeds. In other words, we do the most thinking and spend the most money we will spend during the whole year. By receiving your payment during the pre-season, we can plan effectively and with confidence. We know we will be seeding, growing and harvesting vegetables for you, and we have the funds to purchase what we need to make this happen. We treasure our relationships with our members and design the farm with your meals in mind! the opportunity to walk the fields, smell the soil and see your crops growing. Show your kids how food grows! If you will be away for your share pickup, we encourage you first to try to find a friend, neighbor, or family member who might like to enjoy your vegetables and send them to pick up. If you can't find someone else to enjoy your produce, let us know and we will donate your share or distribute it to others.